It was fantastic! Movies never make me cry but I welled up three times! If you like an endless avalanche of fast-paced dialogue it is very good. I thought it was very good. Very much a Sorkin movie. It was good. Very Sorkin. I don't think the movie did a good job of explaining why exactly I should feel bad for Molly, or side with her in her decision not to name names. It felt like it wanted me to, but it didn't give me personally enough of a reason to. Between this and Steve Jobs, I was like, "does Aaron Sorkin have a teenage daughter?" – answer: yes. I agree. 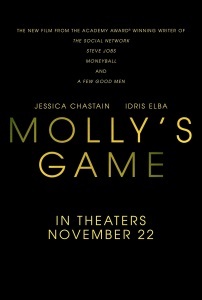 It's very Sorkin--very slick, very fast-paced dialogue, some very good insights--but I sided with Idris Elba's character with the ongoing frustration about why Molly wouldn't just name names. It felt very belated and half-assed to just sort of make it about her random sense of personal honor--nothing we'd really seen about her backed that up, I felt. I very much enjoyed the movie, but a little skeptical voice in the back of my head wonders how accurate it is. Particularly when Jaffey asks Bloom why she's turned down five offers to adapt her book into a movie and she simply answers, "creative differences." Well, obviously she found someone who was willing to make the movie on her terms. How much is she Mary Sue-ing herself? Do we believe her when she says the women who worked for her never engaged in prostitution with the players? And it seems at a minimum being willfully obtuse to not know that her new players are Russian mafia — a guy showing up with his own armed security should be a tip-off that something is up. Especially given her attitude about sports betting, where she also turns a blind eye — it can't occur in the gaming room, so she can truthfully claim she never directly observed anyone engaged in sports betting, but she clearly knows it's going on; she even has TVs installed for the benefit of the sports bettors. It's hard to believe she wouldn't have some inkling of the nature of the Russian players, even if she could claim she had no certain knowledge of it. And I only just now realized upon re-reading my previous comment that Molly's legalistic view of knowledge ties in to her conversation with her father at the end. Her father admits he was emotionally distant from her growing up because she knew he was cheating on her mother. She claims she didn't know until she was twenty...but that's in the same "with absolute certainty" sense that she didn't know about the sports betting, or didn't know that her Russian players were mobsters. She knew about her father's infidelity in the "had very strong reason to believe" sense from a young age, and he knew she knew. I enjoyed this movie, but it betrays Sorkin's roots as an author. I felt the film was about 15 minutes too long, and this, not so coincidentally, corresponded to the 15 minutes of Molly's continuing protestations that she wouldn't name names and hadn't done anything wrong. Just watched this yesterday. The beginning at the skiing competition was great (and very Sorkin-y), and the end which took us back to the competition made me tear up. One thing irked me: what the hell was up with the dad spending 10 minutes mansplaining his daughter's life? She even tried to cut him off with, "no dad, that's not why..." I appreciate the dad's influence in the beginning and in the flashbacks, but I think it was unnecessary to bring him back in Central Park in the end. Just watched this tonight and really enjoyed it. I think it seemed very Hollywoodesque but how much of that was driven by the real Molly Bloom and her justifications for not naming names? The feminist in me was raging that she wouldn’t give up the names and had to pay the penalty just to cover up the mistakes that rich men had made. I felt like her mother was erased in this story and her father centered, but if that’s how Molly viewed her own life then I can’t really argue with that. I appreciated the exploration of the weak egos and flaws of powerful men with nothing to lose contrasted by Molly who had everything to lose. Even when she lost it was still satisfying to see her play the game. It didn’t actually feel like a 2 hour and 20 minute film - a testament to its strength. It was very, very good, but yeah, the nagging voice in my head said "Why should I by on Molly's side," 'cause the film so very clearly wanted us to be. and Jessica Chastin in low cut dresses can be very convincing, but she was incredibly or willfully stupid. Not much reason to sympathetic to the character, let alone like her. Just 'cause it's pretty woman failing it, that doesn't make it better than the stereo typical male doing the same.